The purpose of this study was to adapt Preservice Teachers’ ICT Competencies Scale which was developed by Tondeur, Aesaert, Pynoo, Braak, Fraeyman, and Erstad (2017) into Turkish. The participants were composed of 206 preservice teachers studying at Gaziosmanpaşa University during 2017-2018 academic year. Confirmatory factor analysis was performed after the translation process of the scale. The results showed that the Turkish version fits the original two factor structure. The correlation coefficients between the data obtained from the Turkish version and the data obtained from General ICT Tendency, Reality Shock Expectation, and Prospective Teachers’ Perceived Competencies about Integrating ICT into Education were examined to test convergent, divergent and concurrent validity. The results indicated that the data obtained from the Turkish version of the scale were valid. Moreover, the Cronbach alpha coefficients indicated that the data were internally consistent. In conclusion, the Turkish version of Preservice Teachers’ ICT Competencies Scale was determined to have good psychometric properties to be used in Turkish context. Bu çalışmada Tondeur, Aesaert, Pynoo, Braak, Fraeyman ve Erstad (2017) tarafından geliştirilmiş olan Öğretmen Adayları için BİT Yeterlikleri Ölçeğinin Türk dili ve kültürüne uyarlanması amaçlanmıştır. Araştırma 2017-2018 Öğretim yılı Güz döneminde Gaziosmanpaşa Üniversitesi’nde öğrenim görmekte olan 206 öğretmen adayı üzerinde yürütülmüştür. Çeviri işleminin ardından elde edilen veriler üzerinde doğrulayıcı faktör analizi gerçekleştirilmiştir. Doğrulayıcı faktör analizi sonucunda, ölçeğin iki faktörlü özgün formunun doğrulandığı görülmüştür. Yakınsak, ayırt edici ve eş zamanlı geçerliği sınamak için uyarlanan formdan elde edilen veriler ile Genel BİT Eğilimi, Gerçeklik Şoku Beklentisi ve Öğretmen Adaylarının Eğitimde Bilgi ve İletişim Teknolojilerini Kullanmaya İlişkin Yeterlilik Algıları ölçeklerinden elde edilen puanlar arasındaki korelasyon incelenmiş ve uyarlanan ölçeğin ilgili geçerlik türlerine sahip olduğu belirlenmiştir. Güvenirlik analizi için hesaplanan Cronbach alfa iç tutarlılık katsayısı, ölçek boyutlarından elde edilen verilerin güvenilir olduğunu ortaya koymuştur. Araştırmanın sonucu olarak, Öğretmen Adayları için Bilgi ve İletişim Teknolojileri Yeterlikleri Ölçeğinin Türkçe formuna ait psikometrik özelliklerin iyi düzeyde olduğu belirlenmiştir. Baumgartner, H., & Homburg, C. (1996). Applications of structural equation modeling in marketing and consumer research: A review. International Journal of Research in Marketing, 13(2), 139-161. Bollen, K. A. (1989). Structural equations with latent variables. New York: Wiley Publications. Brown, T. A. (2006). Confirmatory factor analysis for applied research. New York: The Guilford Press. Chan, F.-M. (2002). ICT in Malaysian schools: Policy and strategies. Workshop on the Promotion of ICT in Education to Narrow the Digital Divide, (s. 15-22). Tokyo, Japan. Dilalla, L. F. (2000). Structural equation modeling: Uses and issues. In H. E. Tinsley, & S. D. Brown, Handbook of applied multivariate statistics and mathematical modeling (pp. 440-456). San Diego: Academic Press. Fu, J. S. (2013). ICT in education: A critical literature review and its implications. International Journal of Education and Development using Information and Communication Technology, 9(1), 112-125. Godinho, T. (2015). Portugal: Country report on ICT in education. Brussels: European Schoolnet. Günbatar, M. S. (2014). The study on development of information and communication technology attitude scale. Journal of Kırşehir Education Faculty, 15(1), 121-135. Hair, J. F., Black, W. C., Babin, B. J., Anderson, R. E., & Tatham, R. L. (2006). Multivariate data analysis. Upper Saddle River: Pearson Prentice Hall. Hew, T. S., & Leong, L. Y. (2011). An empirical analysis of Malaysian pre-university students' ICT competency gender differences. International Journal of Network and Mobile Technologies, 2(1), 15-29. Kim, H., & Cho, Y. (2014). Pre-service teachers’ motivation, sense of teaching efficacy, and expectation of reality shock. Asia-Pacific Journal of Teacher Education, 42(1), 67-81. Kline, R. B. (2005). Principles and practice of structural equation modeling. New York: Guilford Publications. Laake, P., Olsen, B. R., & Benestad, H. B. (2007). Research methodology in the medical and biological sciences. Amsterdam: Elsevier Academic Press. MacCallum, R. C., Browne, M. W., & Sugawara, H. M. (1996). Power analysis and determination of sample size for covariance structure modeling. Psychological Methods, 1(2), 130-149. Mardia, K. V. (1970). Measures of multivariate skewness and kurtosis with applications. Biometrika, 57(3), 519-530. Marsh, H. W., Hau, K. T., & Wen, Z. (2004). In search of golden rules: Comment on hypothesis-testing approaches to setting cutoff values for fit indexes and dangers in overgeneralizing Hu and Bentler's (1999) findings. Structural Equation Modeling, 11(3), 320-341. MEB. (2006). Öğretmenlik mesleği genel yeterlikleri [General competencies of teaching profession]. Ankara: Ministry of National Education. Muthen, L. K., & Muthen, B. O. (2007). MPlus user's guide. Los Angeles: Muthen & Muthen. Nunnally, J., & Bernstein, I. (1994). Psychometric theory. New York: McGraw-Hill. Özdemir, M., & Büyükgöze, H. (2016). The adaptation of reality shock expectation scale and a study on prospective teachers. 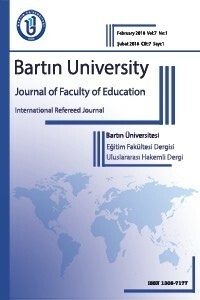 Journal of Kırşehir Education Faculty, 17(2), 243-257. Şad, S. N., & Nalçacı, Ö. İ. (2015). Prospective teachers’ perceived competencies about integrating information and communication technologies into education. Mersin University Journal of the Faculty of Education, 11(1), 177-197. Şimşek, Ö., & Yazar, T. (2016). Education Technology Standards Self-Efficacy (ETSSE) Scale: A Validity and Reliability Study. Eurasian Journal of Educational Research, 63, 311-334. Tabachnick, B., & Fidell, L. (2001). Using multivariate statistics. Boston: Allyn & Bacon. Tasir, Z., Abour, K. M., Halim, N. D., & Harun, J. (2012). Relationship between teachers' ICT competency, confidence level, and satisfaction toward ICT training programmes: A case study among postgraduate students. The Turkish Online Journal of Educational Technology, 11(1), 138-144.